So by now, most of you know that I LOVE to shop for books at thrift and second-hand stores. One of the main reasons is because I just never know what I’m going to find. The element of surprise makes each trip an adventure and when I come across that special book or books, well . . . Yesterday my wife and I went to the D.A.V. (Disabled American Veterans) Thrift in Prescott. This is one fabulous shop, with all sorts of nifty nic-nacs, old clothes, furniture and, of course, books. And I scored! I found some of the old “Companion Library” series of children’s classics published by Grosset & Dunlap back in the ’60s. What was wonderful about these volumes wasn’t just that they made available some of the all-time best stories for young people, but also the way they did it. There were two tales per volume, but also two front covers. If you were looking at one cover and you wanted to see the second, instead of just turning it over, you would flip it upside down and THEN turn it over. Hard to explain with words, but if you saw one you’d understand. And these were the full versions of each story, not some abridged one. So here’s what I snagged: The first volume has Gulliver’s Travels by Jonathan Swift (it says “Revised and Slightly Abridged”. Oooops!) which was first published in 1727. along with Treasure Island by Robert Louis Stevenson. The second volume has The Wind in the Willows by Kenneth Grahame sharing the covers with Tanglewood Tales by Nathaniel Hawthorne. Finally, the third volume has The Adventures of Pinocchio by C. Collodi (in reality, Carlo Lorenzini, NOT Walt Disney) followed on the reverse side by the Howard Pyle version of The Story of King Arthur and His Knights. There were several more of these wonderful books on the shelf when I left, but I didn’t want to be greedy. But if they’re still there next time, consider them gone. I’m going to build a nice library for my grandson and these books are a great way to do it! London was a trove of the magic of childhood, for anyone who had read as obsessively as Winnie had done before the age of twelve. Pull back just a bit, and more of England became implicated: a bit of river out toward Oxford, on which a rat and a mole were busy messing about in a boat. Peter Rabbit stealing under some stile in the Lake District. Somewhere on this island, was it in Kent, the Hundred Aker Wood, with those figures who have yet to learn that sawdusty toys die deaths as certainly as children do. The irrepressible Camelot, always bursting forth out of some hummock or other. 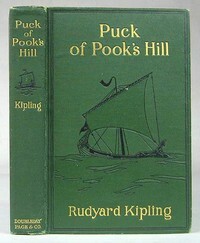 Robin Hood in his green jerkin, Kipling’s Puck of Pook’s Hill . . . The person who would become a lifelong reader should stumble upon very rich stuff first, early, and often. It lived within, a most agreeable kind of haunting. This weekend, The Wall Street Journal published an excerpt from Joe Queenan’s new book, “One for the Books,” which will be published this Thursday, October 25. They titled the excerpt, “My 6,128 Favorite Books.” If you absolutely LOVE books (I mean real books!) and reading, you must read this. Really, honestly, truly. I can’t remember the last time an article put such a huge smile on my face. Do yourself a favor and follow the link above to read this marvelous piece. This what the love of books is all about. Further into The Hobbit with jubilare. Beautiful Mirkwood! My first contribution to The Hobbit Read-a-long! Ah, Mirkwood. Stop for a moment to bask in the deep shadows and fill your lungs with that heavy, still air. Mmmm. It has been too long. There are some places I reach through books to which I return again and again out of sheer love and awe. Mirkwood is one of my favorites. I wonder how many of you who read this, if any, feel the same. WARNING: I fully intended to write a straightforward reflection on chapter VII of The Hobbit. Really. But something happened as I started writing and I couldn’t stop myself. So I went with it, for good or ill. You have been warned. Thorin and the boys just have a rest three or four chapters back?” In fact they did, and the chapter was even called “A Short Rest.” Well, not that short really. They spent two weeks in Rivendell as guests of Elrond, for crying out loud! Sure, they had just escaped from some nasty trolls, but don’t you think three or four days would have sufficed? So here we are four chapters on and the gang is taking another rest. Honestly, is this an adventure or a bed and breakfast tour? (Oh, but wouldn’t The Last Homely House be a great name for a B&B?) I guess I should cut them a little slack. After all, they did just escape lots of goblins and Wargs, and we all know how stress inducing THOSE can be! Besides, who can complain about free airfare? This time the accommodations, and the host, are a bit, ah, different. Unlike Elrond, the new proprietor is large, hairy, gruff, easily angered and somewhat rude. 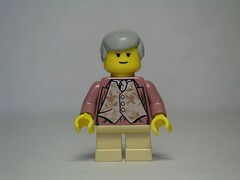 Did I mention he’s also a skin-changer? Some cultures might call him a shape-shifter. He can transform himself into a bear. At will, evidently. His name is Beorn, which comes from Ye Olde English and means “bear.” So our heroes are holed-up with a werebear berserkr. (See, if I were writing a serious analysis of this chapter, I would tell you how the word “berserkr” comes from the Old Norse words, bjorn bear + serkr shirt. But I’m not so I won’t.) Guess there’ll be no “O, tra-la-la-lally here down in the valley!” during THIS stop. Thank you very much, Gandalf! Did any of the traveling party think to check this guy’s references? Now the actual facilities are pretty nice. A large lodge made of wood, clean and warm, with straw mattresses and woolen blankets. Plenty of food served by magical white ponies, grey dogs and white sheep. Most important, there is lots of mead! This is a very good thing. Trust me. I’ve had mead. So Bilbo, Thorin and the gang have a grand meal with Beorn and listen to him tell tales of Mirkwood forest, which is a dark and terrifying place and which happens to be their very next destination. Cheery. But wait, there’s more! Not long after the meal is finished, the door to the lodge slams shut and Beorn is gone and Gandalf tells them, “you must not stray outside until the sun is up, on your peril.” So do you think a dwarf or two regretted drinking that sixth bowl of mead? OK. Maybe this stop isn’t really much of a rest. Now I don’t know about the dwarves, but Bilbo evidently didn’t learn his lesson about Gandalf. He didn’t even bother to warn his cousin, Frodo, about getting involved in any adventures with this guy. Sure enough, guess who doesn’t show up at the Prancing Pony? Maybe someone should give Gandalf’s cousin Radagast a try. One last thing. Frodo and his traveling buddies have an encounter strangely similar to the one Bilbo and Thorin had with Beorn. They accept lodging with a strange character in an amazing place in the middle of nowhere. And get this: both incidents happen in CHAPTER VII! The Hobbit Read-Along continues on Thursday with Chapter VIII, Flies and Spiders, over at http://jubilare.wordpress.com/. Don’t miss it! Were You Educated By A Loose Canon? A while back I asked “What kind of reader are you?” Now I want to know, “What books did you read when you were in school?” I’m not talking about elementary school here. More like middle or high school. What books did your teachers expose you to? Originally the Canon meant the choice of books in our teaching institutions, and despite the recent politics of multiculturalism, the Canon’s true question remains: What shall the individual who still desires to read attempt to read, this late in history? What Bloom is getting at here is that there are far too many books for people to read, even in several lifetimes. Choices need to be made. There are certain books that are definitive of our Western culture, the core if you will. We’re talking about such authors as Dante, Chaucer, Cervantes, Shakespeare, Dickens, Goethe, Milton and, Lord, I’m barely scratching the surface here. Are we, or our teachers, choosing the books we really need to truly understand our culture? I’ll attempt to grapple with more of the details later, but for now please ruminate on this: Can a person understand Western civilization, or even be a part of it, without some minimum knowledge of its greatest writers and thinkers? How would one choose the Canon? It is important to have a secret, a premonition of things unknown. It fills life with something impersonal, a numinosum. A man who has never experienced that has missed something important. He must sense that he lives in a world which in some respects is mysterious; that things happen and can be experienced which remain inexplicable; that not everything which happens can be anticipated. The unexpected and the incredible belong in this world. Only then is life whole.